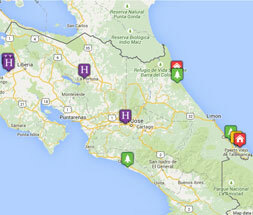 Tribes Overall: "Costa Rica is an amazing and wonderful place. The holiday was fantastic and organising the trip through Tribes Travel mad the whole experience much more easy as well as relaxing . " Tribes Service: "Very easy to book. It was great to have everything we needed organised and prepared for us. I don't think we ha d a single problem." Guides: "The majority of our guides were fantastic. We had a guide provided to us from 'cahuita tours' called Alex who was fantastic, he was local, really cool and loved the area. Another guide we had in arenal for the 'hanging bridges tour' was called Froy and you could tell he loved his job. He was a very interesting guide and loved sharing his knowledge and experiences with us." Social & Environmental Responsibility: "The local people seemed lovely. They had a great outlook on life and seemed very happy and positive. The wildlife and scenery in Costa Rica is amazing! Every place was so different and varried yet always equally as beautiful as the last. The place was surrounded in natural vegetation and wildlife and it was fantastic to see the animals comepletely in the wild." An amazing and spectacular place. The rooms were fantastic and the beds were comfy enough. The food was great and the staff were lovely and kind. The area and gardens in general were magnificent. The staff seemed nice and the room was good. It was a fantastic location right In the middle of San Jose and it was really near all the attractions. The food was nice as well. Fantastic room with a great shower and comfortable bed. The staff were nice and the surroundings were fantastic. The pool was very nice with amazing views everywhere you went! The food was equally good. Fantastic accommodation. The room was very comfortable and the beds and shower was perfect. Very nice place to stay after a tiring day of travel. The staff were very helpful as well. The staff seemed helpful but a bit rigid and distant at times. The room was lovely with a great shower and comfortable beds. The location was great - right off the beach. The food was nice enough but nothing amazing. Overall the place was nice. "I travelled to Costa Rica with just my mum and I think I can say on both our behaves that Tortuguero National Park was the most spectacular place we stayed. We arrived in our accommodation after a magnificent boat ride through the rivers of the rainforest which was unbelievable. The first day we arrived it was lashing rain but we didn't mind one bit! In fact it made the experience even more wonderful. I remember hardly being able to hear my mum speak to me in our room over the beautiful sound of the continuous rain on the leaves above us as well as all the frogs and birds. It was an unforgettable and amazing experience. The place was truly magical - and that's the only word for it."